As many as 1,264 joint officers of national army, police, Satpol PP, and Transportation Sub-dept. are deployed to optimally secure Christmas celebration in North Jakarta.
" 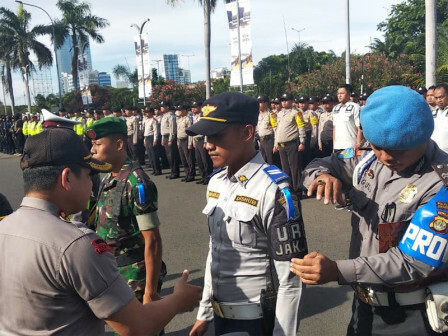 I hope locals also participate to maintain security"
North Jakarta Mayor, Syamsudin Lologau stated that it is aimed to make Christmas run safely, orderly, and conducive. He also asks people to be active in maintaining the environment. "I hope locals also participate to maintain security," he expressed, Monday (12/24). North Jakarta Resort Police Chief, Comr. Reza Arief Dewanto explained that it is a series of operasi lilin (operation candle) that is held on December 21, 2018 until January 1, 2019. Later on, those joint officers are also alerted to anticipate traffic jam-prone areas. By so his party has set up five security posts and 25 traffic security posts from Penjaringan until Cilincing. "We also deploy joint patrol to the field," he stated.